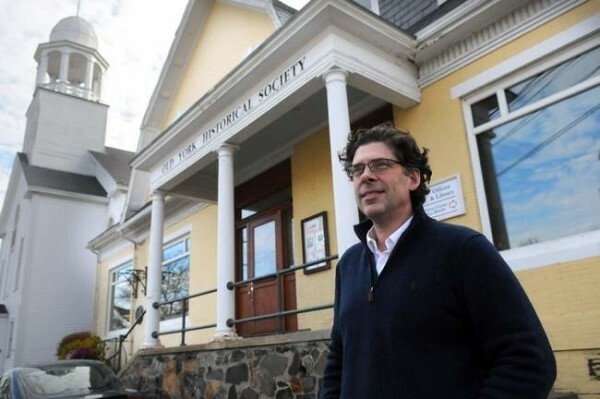 Joel Lefever, director of Museums of Old York , talks about plans to move the staff to another location and sell the administrative building as perhaps a focal point to York Village revitalization. YORK, Maine — One of the anchor buildings in the center of York Village is expected to go on the market by 2017, as the Museums of Old York looks to sell its yellow administration building on York Street and consolidate its offices at the Elizabeth Perkins House. Museums of Old York Director Joel Lefever sees the change as beneficial to both the museum and to the village. These changes are made possible because voters passed a zoning amendment last week that rezones not only the administration building but the former church next door from residential to general zoning – thus freeing both buildings up to be used for retail purposes. The church is owned by York Hospital, and president Jud Knox the hospital has no plans to sell it at this time. Lefever said he believes he was hired three years ago to “revision” how Old York operates, staying true to the mission of the organization but also looking for ways to bring spending in line. “We looked at the functions of all our buildings and the first one that seemed underutilized was the Elizabeth Perkins House” at the corner of Seabury and South Side roads on the York River. The house has a former servants’ wing that had been used in the past as accommodations for summer interns, and it is this space that Lefever and the board has targeted for the administrative offices. The goal is to convert that space over the course of the next year to 18 months, with museum funds that can then be returned when the village property is sold. Lefever said he doesn’t think residents will mind if the administrative offices move. The archives, however, are potentially another matter. Currently, the archives are found in the first-floor library of the village building. The plan is to move the archives to the museum’s property in Kittery that currently houses its collections. The museum bought the Shapleigh Road building in 2014 after selling the former York Beach post office building, where the collections had previously been stored. Lefever, a member of the York Village Study Committee, is excited about the prospect of seeing the village building being used for commercial purposes. The former bank building has a vault, open space and a mahogany-lined board room on the first floor and offices on the second.